Surely one of Europe’s most beautiful rivers, and my home water! The first major block of pool training has come to an end and I finally feel like I have successfully relearned how to swim. It felt great being back to early-morning pool swims in Meadowbrook before work, getting some metres in the shoulders and knocking off some of those excess seconds that built up during my year off – though it’s never going to be the same as those hard yards with great teammates in Fermoy Swimming Club. I’m down to just ticking over in the pool now while I’m doing most of the work in the open water, but there will be some big sessions to come once the open water “season” (I have to be careful using that word in front of the hard-core winter swimmers) winds down and before leaving for Brazil. Since May, I’ve been working on endurance in the open water. Although I live in Dublin and have done a few longer swims there, my aversion to lion’s-mane jellies and love for swimming on the south coast have meant that most of my training has been done at home. I built up the distance at first in the River Blackwater and Knockananig Reservoir in Fermoy, swimming with Dave Mulcahy and also on my own. Once the sea warmed up a bit, I shed the wetsuit and started doing slightly longer swims with Carol Cashell in Myrtleville and Cork Harbour and with Donal Buckley, a.k.a. “Lone Swimmer”, on the Copper Coast in County Waterford, as well as doing a few other swims along the coast of County Cork, including at Sandycove Island and Ballycotton. Steady 3.6 km/h for 6 h! The highlight of my training so far though has to be the Cork Distance Week organised by Ned Denison. 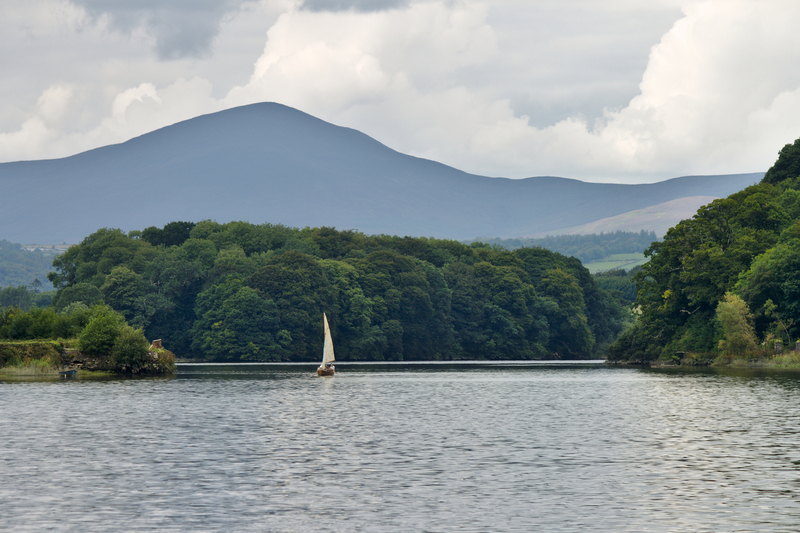 The camp was based around Sandycove Island but included swims in Loch Allua in the Lee Valley, Myrtleville, the River Blackwater in Fermoy, Lough Hyne between Skibbereen and Baltimore, Inniscarra Reservoir, and Boatstrand on the Copper Coast, as well as some purely social events. There was also a 6-hour swim at Sandycove on the last day of the camp (which I successfully completed in order to qualify for my Leme to Pontal swim attempt). The camp was a tough but fantastic week of swimming in great company and beautiful places, and worthy of its own post – at some point, I might even get around to writing that up and posting a few pictures! A selection of photos from the “Vibes & Scribes” Lee Swim 2017 taken by George O’Keefe. I’ve also finally done my first race of the summer, my tenth “Vibes & Scribes” Lee Swim, which starts near the School of Biological, Earth and Environmental Sciences (where I spent a lot of my time whilst I was studying at University College Cork) and carries on down the North Channel of the River Lee, around Custom House Quay, and finishes at Clontarf Bridge. It was a bit of a shock to the system being back in a proper race, but it was good fun battling with Lizzie Lee for the best draft off Ned Denison, and even being pushed off course by Ned for making the mistake of trying to sneak past him on his blind side just before the finish… Enjoy that victory, Ned, I don’t intend to leave you have any more like that for a while! 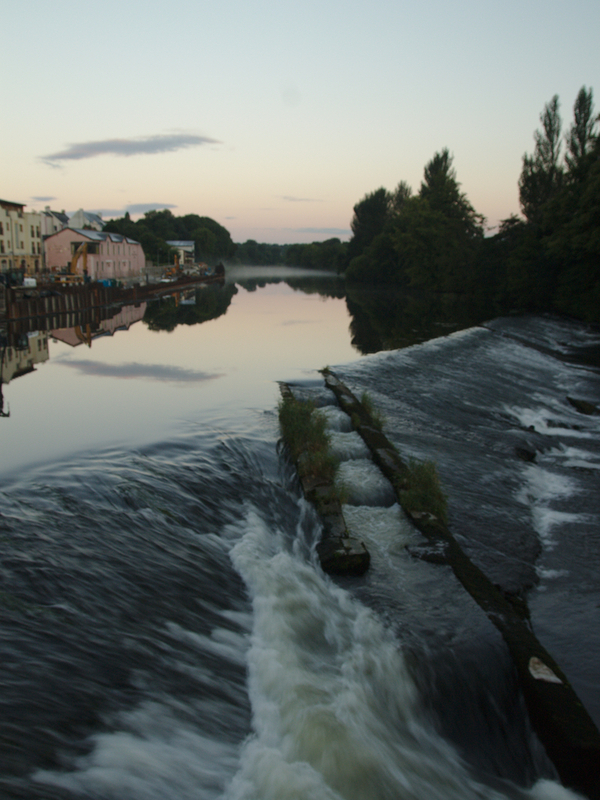 The early-morning mist was just rising off the water when I arrived at Fermoy Rowing Club at 6:30 am last Friday. As Mona, Donal and Maura got the kayaks set up and I got into my swim gear, a string of family and friends gradually gathered around the slipway. It was a nice to have a few people to wave me off for a change. Almost all of my marathon swims so far have had very lonely starts, sometimes in the black of night, so it was nice to have company. It also makes it much harder to back out of the swim if people are watching! At 7:08 am, I hit the water accompanied by my three crew, each in their own kayak. 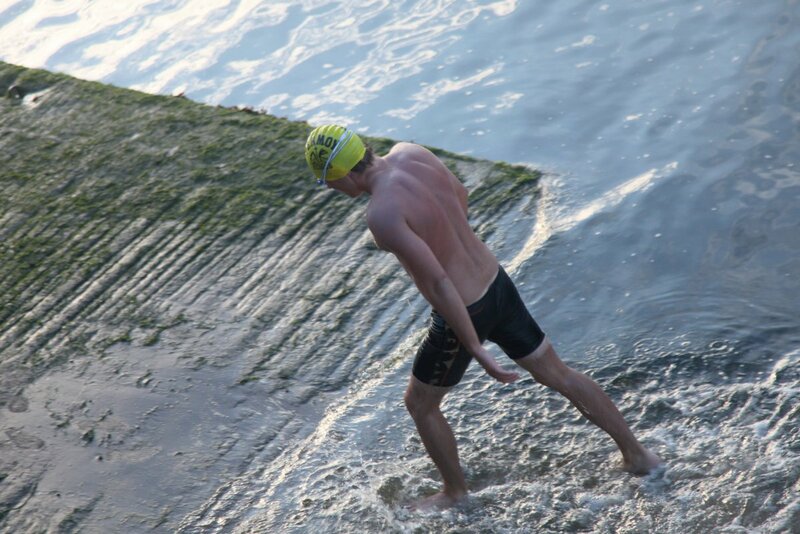 The water felt great: it was dark and fresh and felt quite warm! 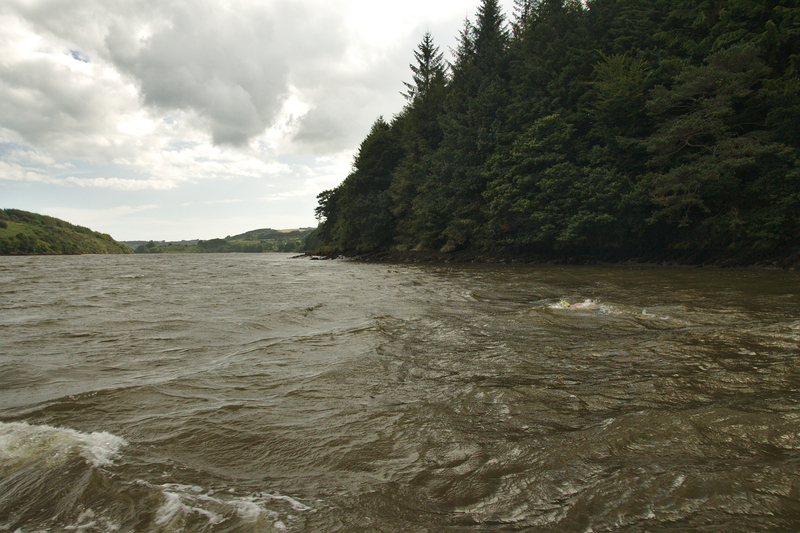 Donal, who was acting as observer for the swim, estimated that the water temperature was somewhere in the range of 15ºC to 16ºC. For the first 250 m, I could see those who had been at the slipway moving along Ashe Quay towards Fermoy Bridge where they could get a perfect view of myself and the three kayakers traversing the weir (photographed above). Once safely below the weir, it was back to the horizontal and off under the bridge, past Blackwater Sub-Aqua Club and into deeper water once more. Although it had taken about 4 hours to get to Ballyduff, I was pleased to be over halfway to Cappoquin, the point at which we’d be switching from kayak support to boat support. 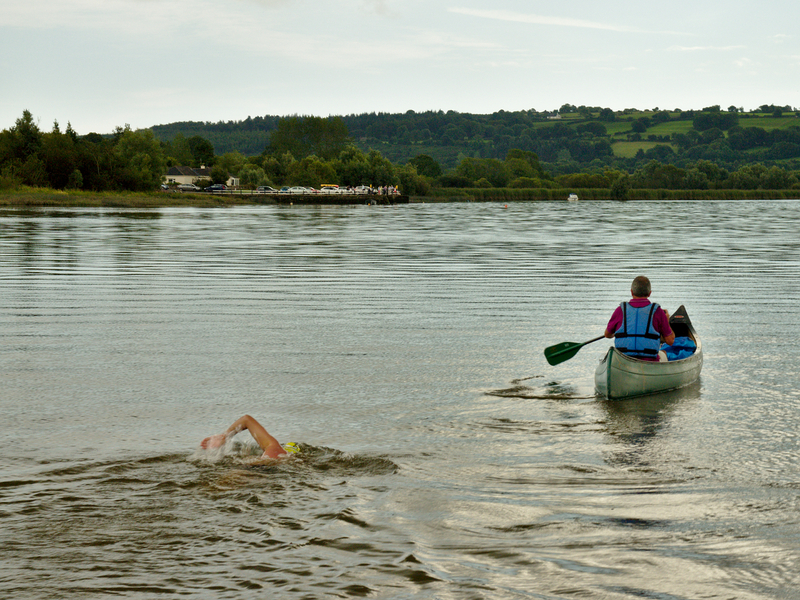 I regarded the Cappoquin as the true start of the swim, much as English Channel 2-way swimmers regard the first leg of the swim as “the swim to the start”. On the long stretch of river from Glencairn Abbey past Fort William and into Ballyin, my arms began to feel very heavy. 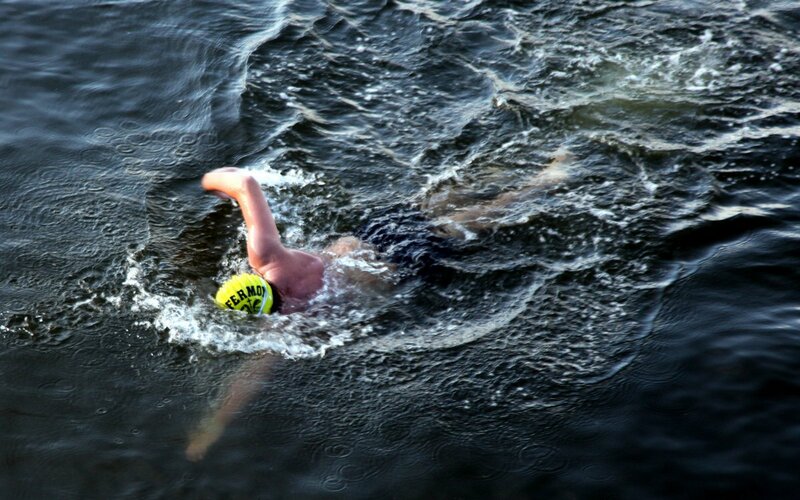 Freshwater swimming is generally tougher on core muscle groups, especially postural muscles on the back. This is because of the lower body position caused by the lack of buoyancy relative to the sea. The promise if seeing yet more family, friends and supporters on Cavendish Bridge just around the corner in Lismore and the promise of saltier water later on drove me on! Passing Lismore and the Ballyrafter Flats, there were one or two very bad smells. Donal said that there was something dead on the bank so that is the most likely explanation. At Bullsod Island, we were propelled down the final set of rapids before finally reaching sea level. There was some unexpected slow and shallow water after this but only for a few hundred metres. Once in deep water, I was due another feed: this time a caffeinated gel. It wasn’t long before we were at a bend on the river which brushes right up against the main road. Again, there were plenty of people lined up to cheer on the swim. This time, they were treated to a perfect view of a feed of 300 ml High5 ZERO electrolyte drink and a handful of jelly babies! It was now only about 2 km to Cappoquin Rowing Club, where Mona and Maura would be leaving us and Donal would be transferring into the boat. About 30 minutes later, we were almost at Avonmore Bridge and I could see the town of Cappoquin and the support boat “Maeve Óg” on the other side. This bridge, by the way, was formerly known as Victoria Bridge and was blown up in one of the many shameful acts of the War of Independence. 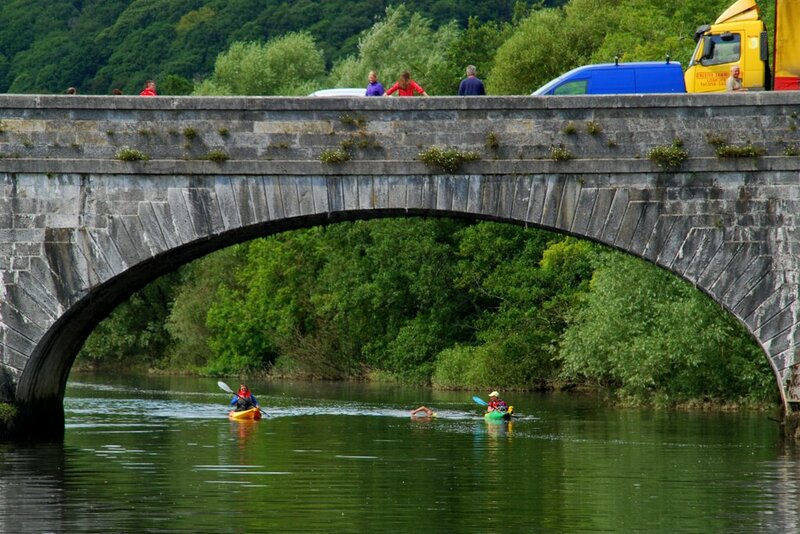 It was rebuilt under the Irish Free State during the 1920s and was later renamed Avonmore Bridge. The word “Avonmore” is an anglicisation of the Irish name for the river and is commonly used in the names of houses, etc. near the river but is rarely used when referring to the river itself. Anyway, enough about the bridge! By the time that I got to the Rowing Club pontoon, Donal had already transferred to the boat (but not before being caught falling out of the kayak before he did so) and I could see that there was a lot of activity on the bank. I acknowledged Tony, Paul, Róisín, Ellen and Donal on the boat and swam on. Maura hopped out, followed shortly be Mona. I was very pleased to have made it to this point and took comfort in the fact that the swim was straightforward from here on in: I would just have to keep putting one arm in front of the other, take my feeds from the boat and keep my mouth shut. Once I did these things, I knew that I would make it to Youghal. The next hour or two was pretty uneventful. 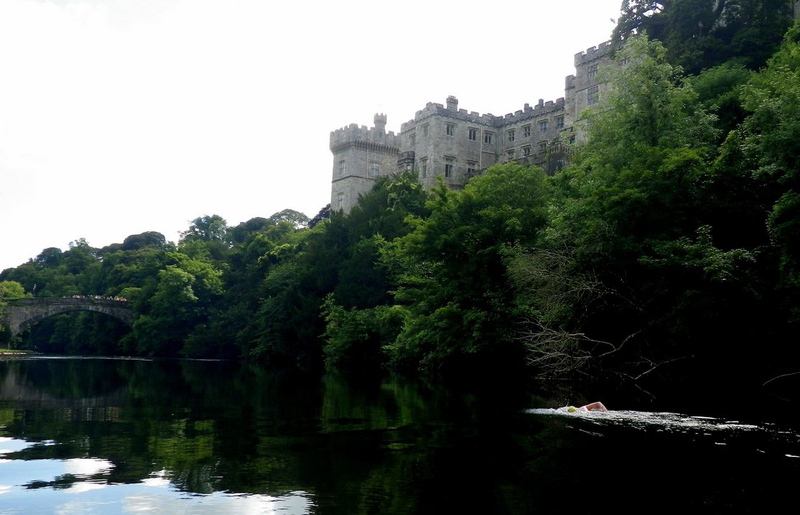 I crossed off way-points in my head: the slipway where Cappoquin Rowing Club have their regattas, the confluence with the River Finisk, Dromana Rock, Dromana House, Camphire House and so on. It felt to me like progress was slow, but that probably had more to do with the calm, deep water and the dull conditions than it actually being slow. This part of the river is truly stunning and suitable for a range of aquatic activities which includes swimming, canoeing, waterskiing, windsurfing and even sailing! As we passed Villierstown Quay, we picked up a lonely figure in a Canadian canoe. He stayed with us as we passed the crowd waving from the quay-side and for a good bit beyond. At the next feed, we were very close to the reed-beds at the bank and I could see the strength of the current for myself. This gave me more confidence that I was making good progress towards my goal. My only concern was that the tide might turn before I got to the mouth of the river and I would be pushed backwards – there was only a very slim possibility of tht happening, though. Tony and the crew did a great job of keeping me out of the worst of the chop. My natural tendency was to go for the middle of the river where I presumed that the current was strongest. Tony, however, knew that I would avoid the worst of the chop while only losing a minimal amount of current be staying nearer the shore. This was counterintuitive for me but this is why you employ local knowledge when undertaking a big swim! After Ballynatray House, the ancient ruins of Molana Abbey and the Knights Templar’s castle at Templemichael passed by on our right-hand-side. 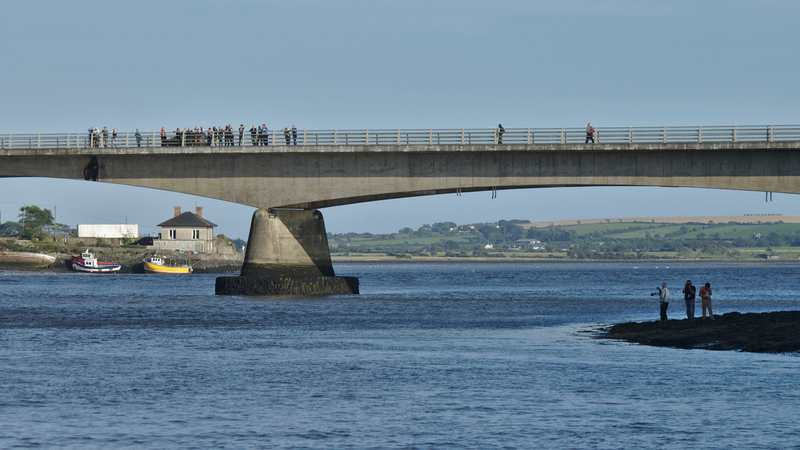 It wasn’t long before we got a very clear view of the bridge with a crowd gathered on it and a few more people on the shoreline beneath. There was a slight increase in the swell and chop as we went under the bridge but nothing major and nothing as bad as it was the last time I swam out into the bay. 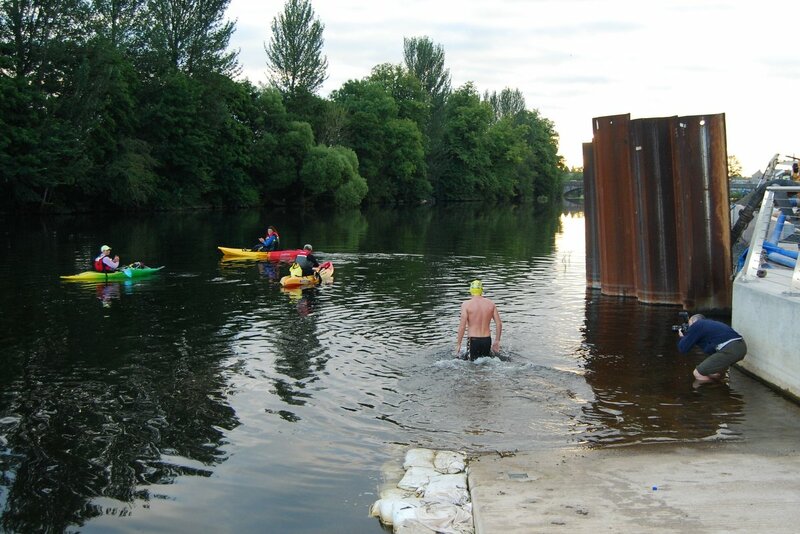 Going under this bridge was a big moment in the swim for me. It was one of the places that had originally made me think of this swim and it meant that I was less than 2 km from the finish. Crossing the bay was relatively easy. I was on a high as I knew that I was going to finish and that what was really quite a daft plan actually worked. I was able to up my pace a little with the adrenaline in my system, knowing that I would finish and that I wouldn’t let down everyone who had shown me such great support throughout the day. As we passed the first buildings in the town, the crew told me that we weren’t going to land at Front Strand, as planned, and would instead be landing at the slipway near Neal’s Quay in the middle of the town. At first, I was a bit annoyed as I had wanted to finish at the strand but when I asked why they told me that it was too dangerous to go to the strand. Well, you can’t argue with safety! 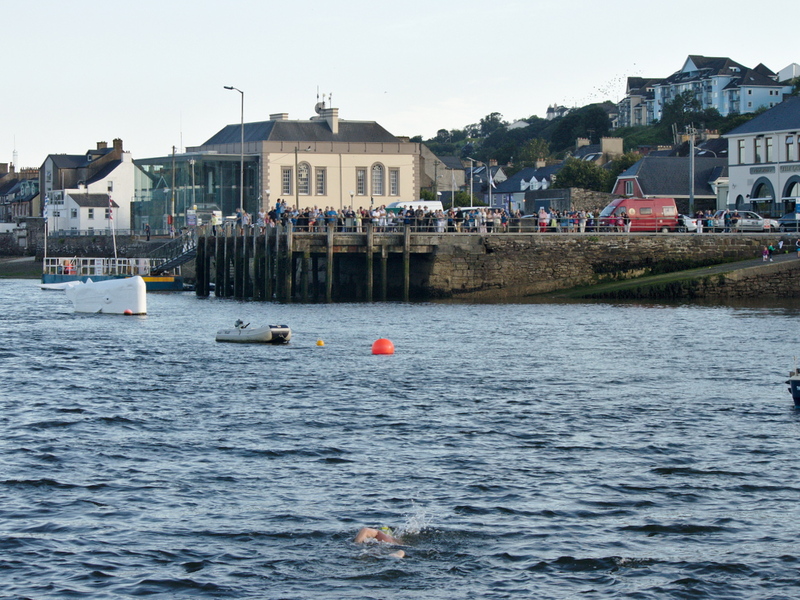 Anyway, it would be a swim of 60 km from a slipway in Fermoy to a slipway in Youghal so I couldn’t complain too much. Once I could see the slipway myself, I headed in at a good pace and the boat stayed out in the deeper water. After 12 hours 8 minutes in the water, I stood up on the slipway and turned around to signal to Donal that I was above the waterline. I was delighted when I looked up and saw so many friends and family on the quay, as well as plenty of strangers! My sister, Amy, was first down the slipway to me with my towels. She was soon followed by the rest of my family and a few local media people. There was a lot of stuff going on at the finish so there was little opportunity to take the team photographs that we wanted but we got a few anyway. The video below by Youghal Online shows the end of the swim and the atmosphere on the quay afterwards. I was totally unaware of how vacant I look and how inebriated and rural I sound after 12 hours in the water. I had recovered a good bit by the second interview (about an hour later). There are so many people to thank in relation to this swim. I must first of all thank Tony Gallagher of Blackwater Cruises for his time and expertise in getting this swim off the ground – it really could not have happened without him! Great thanks are also due to my good friend, Donal Buckley, who had the hard task of observing from a kayak for the first half of the swim and then transferring to the boat for the second half – he did a superb job as well as taking lots of top quality photographs! 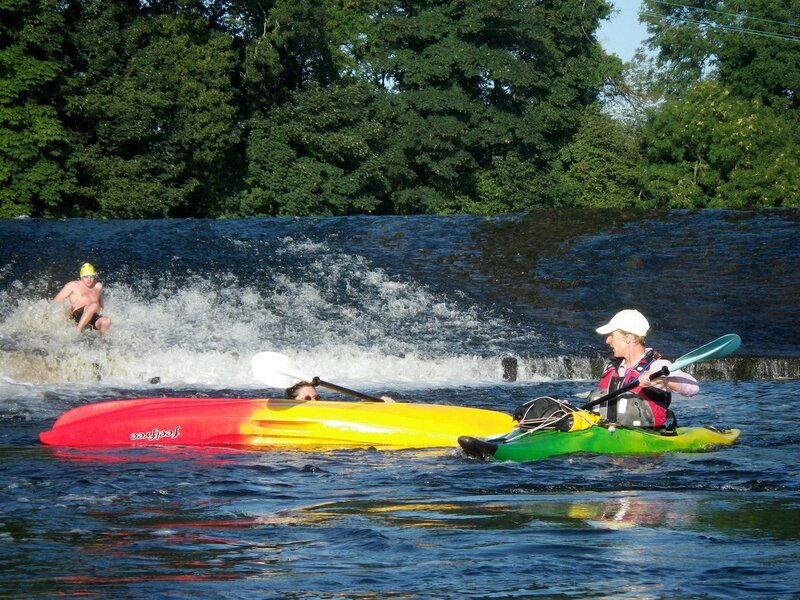 Mona Sexton and Maura Murphy also did a fantastic job of kayaking with me from Fermoy to Cappoquin. Paul Noonan and Róisín Lewis were top class crew on the boat: Paul did an amazing job of keeping in contact with the outside world and Róisín managed all of my feeds perfectly and gave me great encouragement. 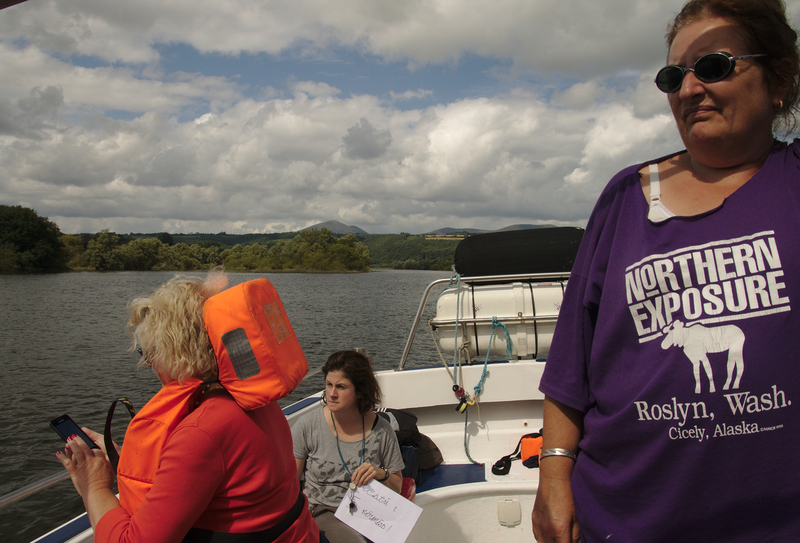 Ellen Lynch of the Avondhu Press was also on board “Maeve Óg” for the second half of the swim to take notes and photographs – that’s hands-on journalism for you! Thanks are also due to the manager of the Quays Bar, who gave me a complimentary meal of steak and chips after the swim, and the very kind lady who let me use her shower to get the muddy water and grease off of myself before getting dressed. 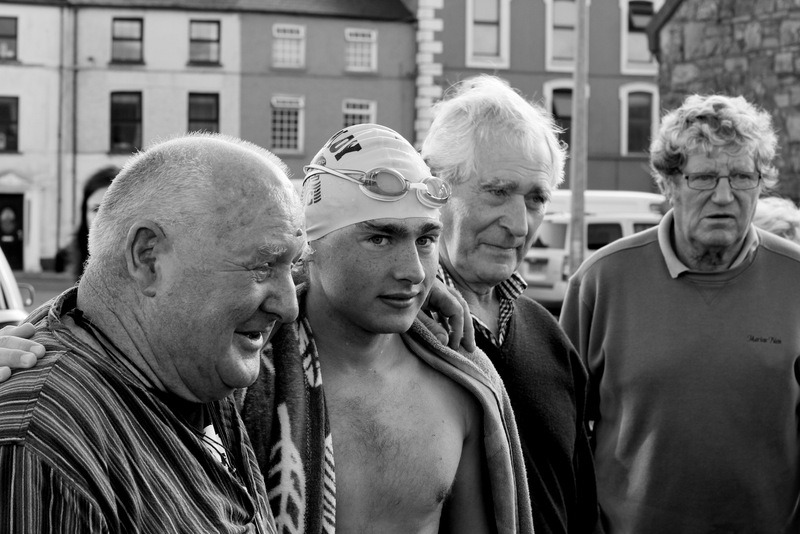 I want to say a huge thank you to all of my family, friends and supporters who were out following the swim from early morning and cheered me on at Ballyduff, Lismore, Cappoquin, Villierstown, Dromore, Conneen, Ballynaclash, Templemichael and Rincrew, the crowd who gave me such a great reception in Youghal and the members of Fermoy Camera Club who took fantastic shots of the swim. I really appreciate everyone’s contribution to this swim and am glad that you all enjoyed seeing the sport of marathon swimming up close and personal. I also hope that the swim has also opened a few eyes to the beauty and heritage of the mighty River Blackwater. I feel very privileged that the Great River is such a big part of my life. I’ll finish my report with this great photograph by Lee Fox. It shows, from left to right: Tony Gallagher (pilot), myself, Grandad (Tom Baker) and Leo Bartley.